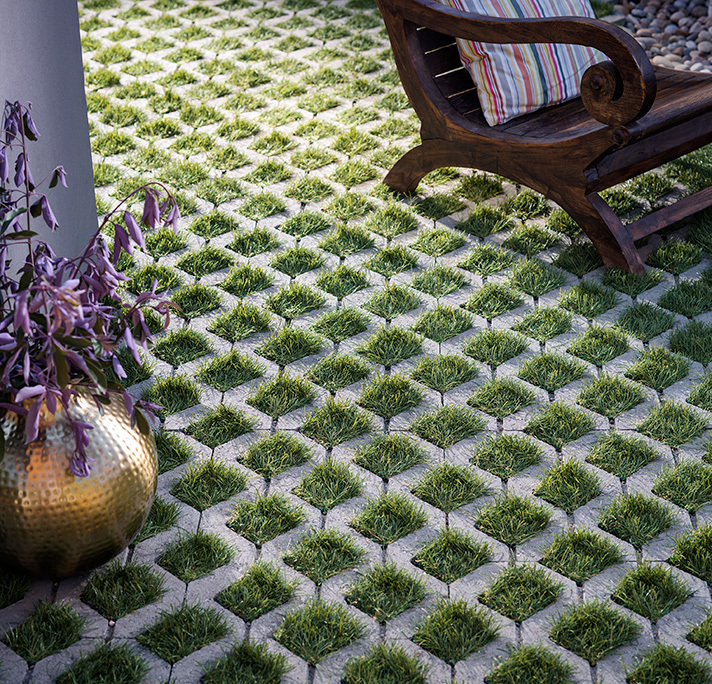 Grow greenery directly through your hardscape with Turfstone pavers by Belgard. “You’ve probably seen Turfstone, and haven’t even noticed it was there,” says Ryan High, a territory manager for Belgard. The gray pavers look like lattice, and that grid-shaped design is what distinguishes Belgard’s Turfstone from other paving materials. Once set, voids – those gaps between the concrete panels – can be planted with grass or filled with another aggregate, allowing stormwater to move through the surface, eliminating the need for an irrigation system. “Permeable pavement is a huge buzzword in St. Louis right now,” High says. But the material predates the sustainability hype, stretching back to 19th century Europe, when builders needed a cost-efficient alterative to cement. Cement was scarce in Europe after World War II, too, and that heightened the demand for pervious concrete overseas. Back home, though, Americans didn’t suffer the same types of material shortages — hence, permeable pavement didn’t gain traction stateside until the 1970s. By then, the draw was mostly environmental. Rapid development caused runoff, which city planners realized was eroding soil and degrading water quality. “Belgard’s turfstone,” High explains, “allows rainwater to be filtered back into the soil naturally.” The unique absorption process naturally curtails runoff while trapping suspended solids and reducing pollutants from the water. “Belgard’s turfstone can be used in a wide range of applications, but it’s commonly seen where there’s a vehicular traffic requirement,” says High, pointing to commercial parking lots. Lately, though, the material has attracted residential consumers looking for natural pavement for walkways and paths, patios, gardens — even pool decks, where the benefits of natural drainage really shine. This pressed concrete product packs a lot of punch, offering a natural aesthetic that’s durable and more than twice as dense as traditional concrete pavement. 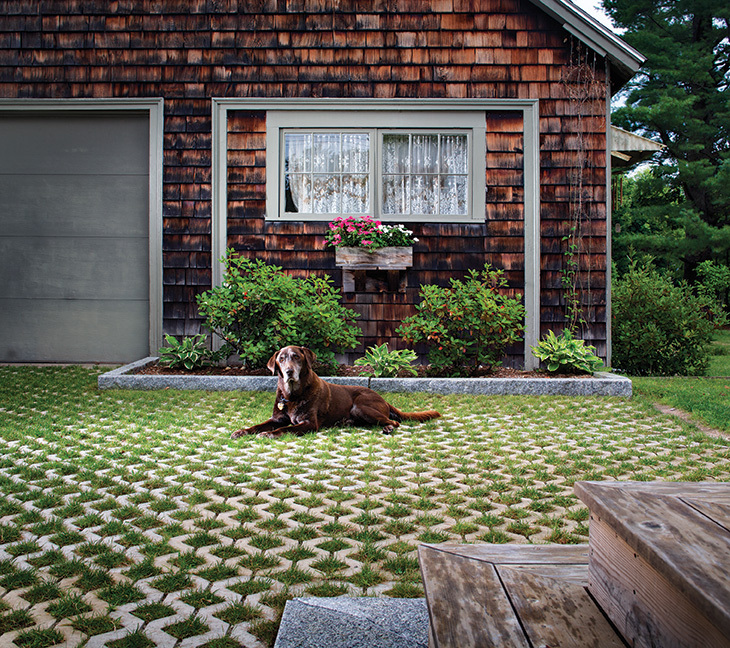 “Belgard’s turfstone pavers are also extremely low-maintenance,” High adds. Properly installed, the paving is snowplow safe, and homeowners can drive a lawnmower right over it, too. If a paver cracks, simply replace the damaged stone. Talk about no muss, no fuss! When it comes to layout, High says, “Homeowners can’t switch up the design through application.” Dress up the paving, then, by experimenting with void spaces. Grass is the go-to filling for homeowners coveting a nature-inspired landscape. Any grass variety should do the trick, High says, quickly qualifying that statement with a reminder: “Because the grass won’t have space to spread, it’s best to pick a hardy variety,” he adds. For extra oomph and a play on height, consider planting a few tall grasses in void spaces. And don’t discount other aggregates: Purple trap rocks and river pebbles, for example, can pack a powerful, stylish punch.